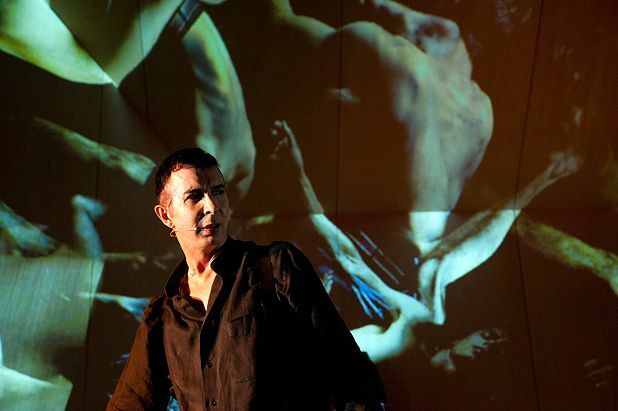 A one-man musical based on eyewitness accounts of the London Plague of 1665 starring Marc Almond sounds on paper like the kind of parody you’d find on the website fakefringe.com. Indeed, the 80s pop icon seems nervous as he takes to the stage in black kilt and Argyle jacket, as though he isn’t quite sure what he’s got himself into. Almond’s no actor in the sense of physically inhabiting a role, but you quickly realise that few other performers possess the vocal range to do justice to the concentrated emotion of Mark Ravenhill’s libretto. Drawing on extracts from Samuel Pepys’ diaries, the ten short movements capture aspects of everyday life at a time of deep crisis, including the horrors of imagining yourself being tossed into the pit filled with bodies. The intensity of the subject matter is underscored by director Stewart Laing’s stark set, which also carries projections, including a scene of Almond walking through a busy, modern-day London thoroughfare that is extremely moving. If anything Almond and Ravenhill are rather let down by Conor Mitchell’s score, which is so relentlessly harsh it fails to complement the nuances of the text. A musical and dramatic coup de théatre, however, brings a sense of genuine excitement to the finale. Traverse Theatre, 228 1404, until 28 Aug (not 22), times vary, £17–£19 (£12–£13).